And we are already into the month of March! I really wish time would slow down, there are just too many recipes to try, but too little time! This dish today is prepared for Cook Like a Star, hosted by Zoe from Bake for Happy Kids, Baby Sumo from Eat your heart out and Mich from Piece of Cake. The theme this month is Delia Smith, and as I don’t have a single collection of her recipe, I decided to head to her webpage to search for some recipes to try. The first recipe that caught my eye was this really easy-looking roasted prawns. 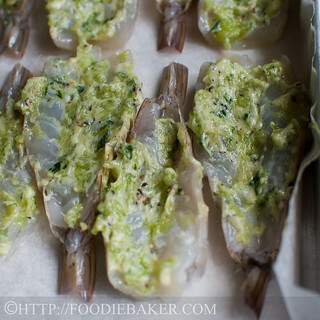 The prawns are butterflied, flavoured with a delicious mix of garlic, parsley, butter and lemon, and then roasted for just only 5 minutes (well, mine took 1 minute more, but hey, that’s still a really quick dish to get on the dining table!). 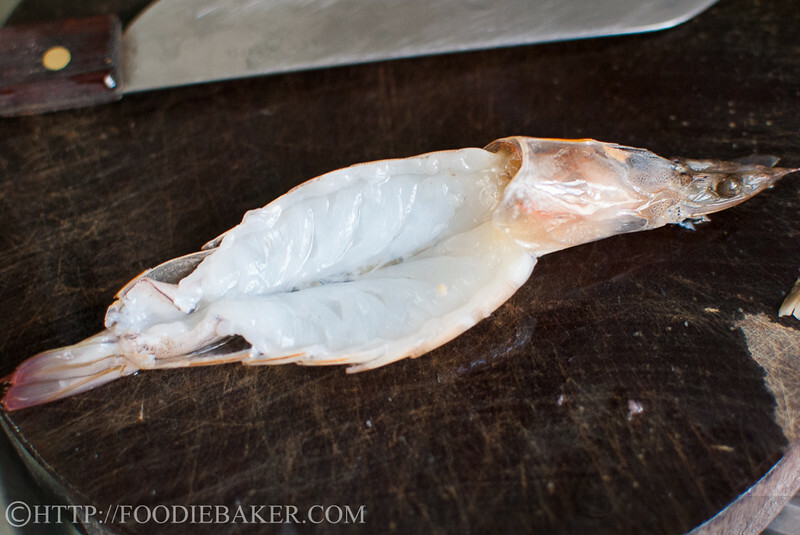 Well, of course, a little preparation is needed as the prawns need to be butterflied and all, but it really isn’t very difficult and to make things even easier, I’ve included step-by-step photos on how to butterfly prawns! And here they are! 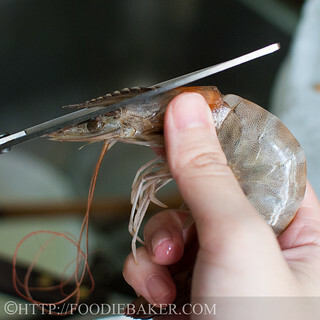 1) Snip of the sharp spiky part on top of the prawn's head (known as rostum). 2) Snip off the long, curly feelers/antenna next. 3) Snip off the front legs (known as periopods). If desired, you can snip off the legs behind as well (known as pleopods). 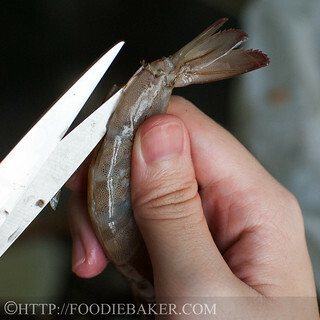 4) Snip off the sharp spiky part at the prawn's tail (known as telson). 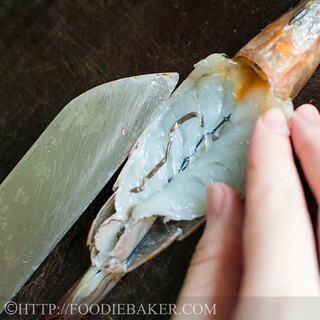 5) Starting from behind the prawn's head, cut the shell along the middle of the prawn's body. 6) All the way to the tail. 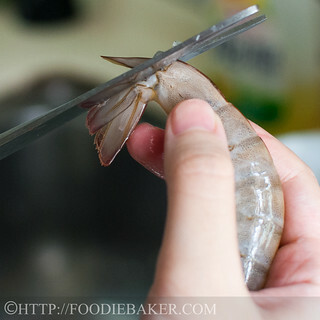 7) Use a sharp knife and make the incision slightly deeper (but not through the prawn). 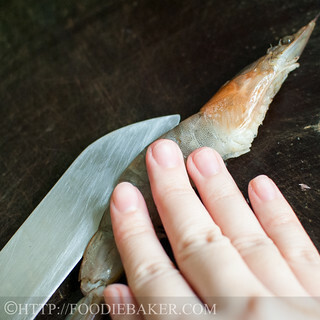 8) Open the prawn up like a butterfly and press it down gently so that it stays that way. Give the prawns a good rinse and get rid of the intestinal track. Ta-dah! Cleaned and butterflied prawns! The steps to butterfly the prawns without heads are essentially the same, just twist off the head first, then follow from Step 4 onwards. 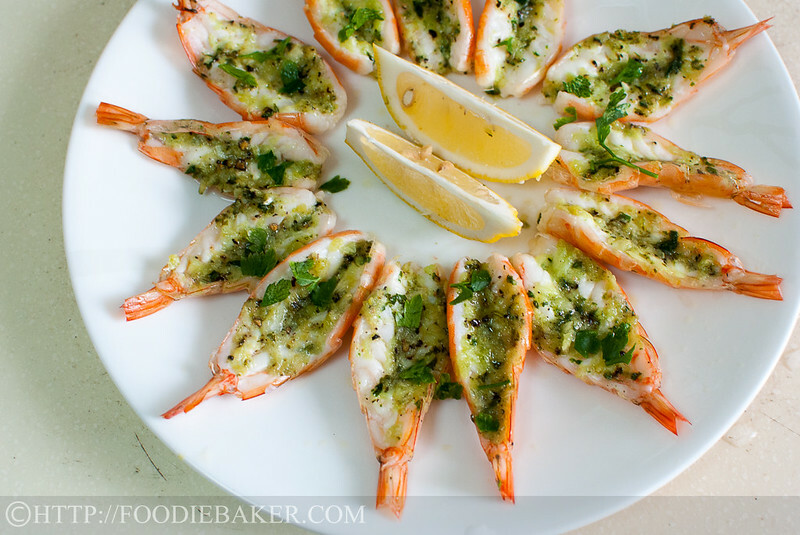 Now, if you think butterfly-ing prawns is easy, wait till you see how the delicious garlic-parsley butter is made – it’s insane easy! 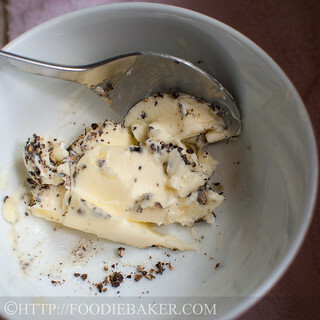 1) Soften some butter and add in some freshly ground black pepper. 2) Combine salt (using sea salt here), garlic and Italian parsley together. 3) Pound until you get a paste. 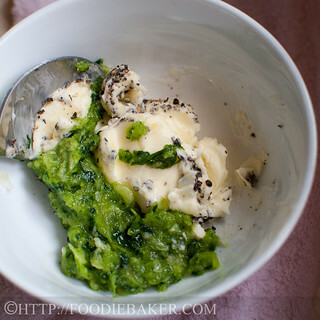 4) Mix with the softened, peppered butter. 5) Squeeze in some lemon juice. 6) Spread it on the prawns and send it to bake! I’m submitting this post to Cook Like A Star hosted by Zoe from Bake for Happy Kids, Baby Sumo from Eat your heart out and Mich from Piece of Cake. Please click on the little froggie below to see all other submissions so far! In addition, I’m also submitting to Recipe Box hosted by Chaya from Bizzy Bakes! Butterfly the prawns (without the heads): Twist the heads off the prawns. 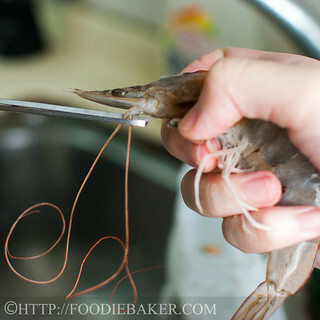 Using a pair of sharp kitchen scissors, snip off the sharp, pointy spike at the tail and trim off the prawns legs if desired. Cut, using the kitchen scissors, the prawns shell along the middle of its back all the way to the end of the tail to get an incision. Lay the prawn flat on a chopping board. Use a sharp knife and slice the prawn along the incision to make a deeper incision, taking care not to cut all the way through the shell. 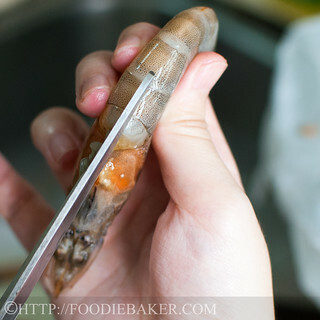 Open the prawn up like a butterfly and press it down gently so that it stay open. Rinse the prawn and remove the intestinal track. Season the butterflied prawns with 1 teaspoon of table salt and set aside for 5 minutes. 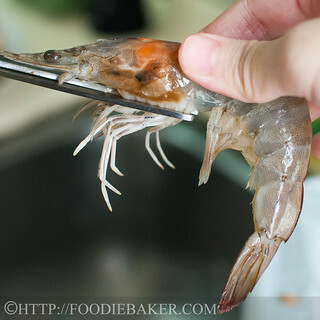 Rinse the prawns, pat dry with paper towels and lay them on a baking sheet (lined with parchment paper) or baking dish. 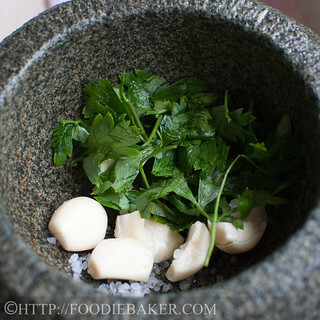 Garlic-Parsley Butter: In a pestle and mortar, combine the peeled garlic cloves, Italian parsley and salt and pound until a paste forms. Combine the paste with the softened butter and season with black pepper. Add in the zest, if using, and the lemon juice. Spread the butter mixture onto the prawns and refrigerate the prawns until needed. Roasting the prawns: Preheat the oven to 230 degrees Celsius (top and bottom heating element). Roast the prawns on the highest rack possible for 5 to 7 minutes until the prawns are pink and opaque. Serve garnished with chopped parsley and lemon wedges on the side. Herbs: Use whichever herbs that you like. 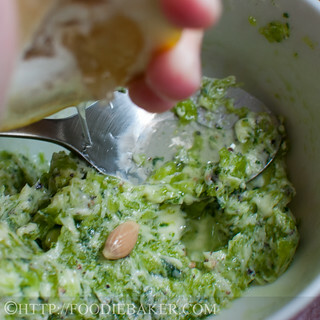 Garlic-Parsley Butter: You can make the butter mixture in a food processor as well. 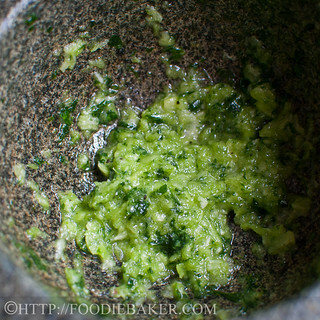 Just process the garlic, parsley and salt until a paste forms and mix with the softened butter. Thank you for the compliment! Haha I’m glad you had eaten before coming here, I always visit food blogs in the dead of the night, a terrible idea! I love prawns! These are good-looking and very delicious! Wow! These look awesome. 2 questions: First, could I follow all these steps and then do them on the bbq? And second, for a wine pairing, how do you think a fruity sauvignon blanc would go? Hi Richard, thank you for dropping by! I’m sure you can do it on a bbq, try to get really huge prawns so they will look more impressive on the bbq! As for wine pairing, I’m sorry to say I cannot help you because I am not an avid wine drinker… Sorry about that! the preparation photograph is awesome too!!! Hi Dedy, thank you so much for the compliments! Really really great and easy to do, one word : wouawwww from Belgium ! 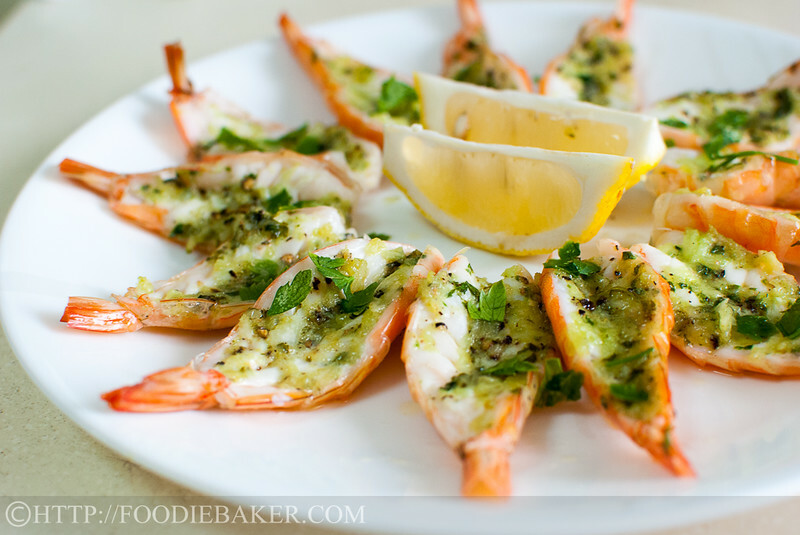 Those are lovely prawns … I have some scampi in my freezer that would be great prepared this way. I like how you butterfly from the back rather than the belly! This dish reminds me of one I had in Italy. Lovelyi photo of the end result. Oh gosh! Pass me that plate please!! I love prawns and these sure look good! I love the sound of this, Jasline. We use olive oil instead of butter when we grill shrimp. Next time, though, I’ll give your method a try and bake them. I bet they’ll be delicious. I was eyeing this recipe, Jasline… looks really good! Love this recipe, so simple and tasty. You presented the instructions so perfectly and the photo’s are amazing, Will definitely be making this soon. These HAVE to be sensational! I’m not normally a fan of Delia’s but this recipe just can’t fail. 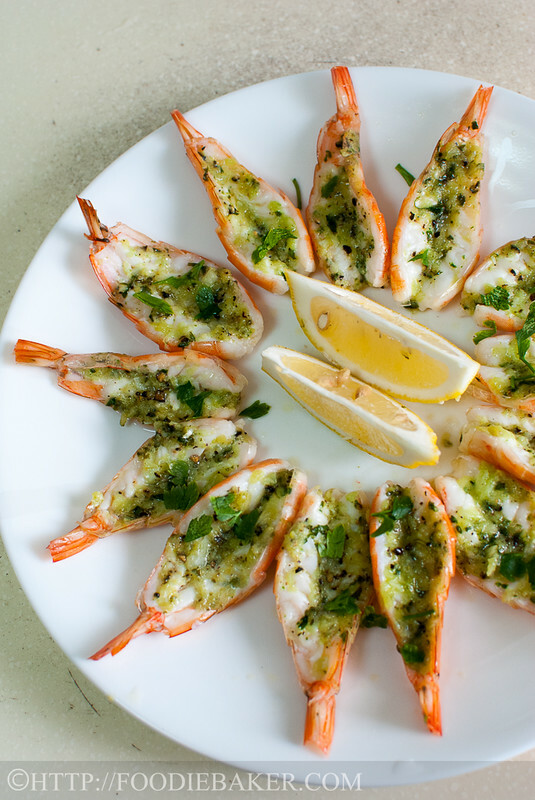 You took just 1 minute to roast these prawns! This recipe sounds amazing. Prior to this event, I have never hear of Delia Smith. Now cooking her recipes, I think she is brilliant with most of her basic, fuss-free recipes. I do this with coriander instead of parsley and it’s delish. Wow, these look super delicious! Yummmmm! 🙂 Thanks for the detailed preparation guide! Delicious recipe and what a wonderful step-by-step!